The Drowning River by Christobel Kent, a Mysterious Review. 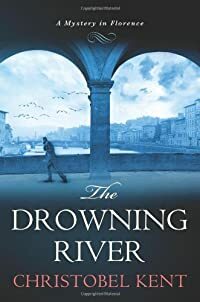 Review: After 30 years as a policeman in Florence, Sandro Cellini leaves the force to become a private detective — "it was too late for him to become anything else" — whose initial case involves the presumed suicide of a Holocaust survivor in The Drowning River, the first mystery in this series by Christobel Kent. When Lucia Gentileschi visits his new office and asks him to look into the circumstances surrounding the recent death of her husband, Sandro is reluctant at first. But something in her story resonates with his own personal experience. "May I ask, Signora," he says, "why you are so sure that your husband did not take his own life?" Her reply is simple: "Because he would have taken me with him. He would never have left me behind." It is a declaration of love, and Sandro knows he must prove it justified. Separately, a young art student has gone missing, her recently purchased handbag found in a local park. Because of Sandro's previous employment with the police, her mother hires him to act as a liaison. At one point he muses that the two cases cannot possibly be related, but when witnesses place both parties in the same place at the same time, he considers there may, indeed, be a link between the two. Some mysteries have the ability to envelop readers in the atmosphere of the setting and immerse them directly into the storyline. The Drowning River is such a mystery. The first couple of chapters describe how Sandro Cellini came to be a private detective, but it is told in such a manner that it feels integral to the plot rather than simply a backstory. The narrative is beautifully expressive, the dialog rich and true. That the two mystery plots are related doesn't come as a surprise, but their connection is neatly handled. The denouement is slightly disappointing in that it seems to be overly staged, but this is a minor quibble in an otherwise exceptional novel that introduces a quite remarkable private detective. The Drowning River was originally published in the UK as A Time of Mourning. Acknowledgment: Minotaur Books provided a copy of The Drowning River for this review.